The Set: FRANK LESLIE’S ILLUSTRATED NEWSPAPERS, New York, both dated May 3, 1873. The Intrigue: A two issue set of the same title with the exact same date? Yes. In regards to standard daily newspapers, especially those printed for major city distribution, it was not uncommon for there to be multiple editions of the newspaper printed on the same day – perhaps a morning and evening edition. However, we have yet to discover a weekly illustrated newspaper who printed more than one version of an issue on the same day. It is this lack of discovery to-date which makes this two-issue set rather interesting. 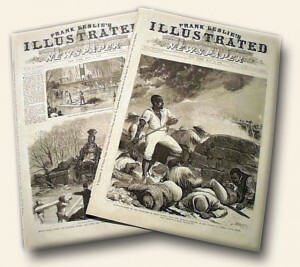 Frank Leslie’s Illustrated apparently printed two nearly identical but different issues for May 3, 1873… each having a different cover. One might think they accidentally reprinted a cover from a previous week for some of the issues, but we have had the other issues surrounding this date, and none of them have either cover in question. Additionally, while the inner pages are almost all the same, there is also another page (pg 125) which is different. Everything else is identical. If anyone is aware of the background concerning this set, please share. Note: Additional (and quite interesting) information concerning both front pages may be found at Colfax Massacre and Richmond Switch Disaster (Rhode Island).